How not to freak out too much about change. Recently I had a week where I was so bone tired I could barely get out of bed; there was no way I was going to be able to focus on anything other than work that was absolutely necessary (even that was a struggle). At the end of that week I got on my yoga mat for my morning yoga session and came into child's pose. Then I started crying. And there I stayed for my entire yoga practice. Crying. And a little bit embarrassed about it. Crying in child's pose: a legitimate yoga practice. Really. I didn't really know why I was crying -- nothing had happened in that week to upset or tire me especially. It took me a little while to work out what was going on: basically my body and my mind were just…done...after several months of significant change in my life. My work circumstances had changed, I'd started a research degree, and I'd moved house. I'm very grateful for all of these changes —they've brought amazing things into my life. Change is not inherently good or bad: usually it's a bit of both. But, big or small, positive or negative, it can be overwhelming, especially if we don't have the space to process how we feel about it. The same thing can happen, hopefully on a smaller scale, when there's a change of plans in our day (think cancelled meeting or coffee date with a friend). Disappointment, upset, fear, anger, frustration, mild panic even. These are all normal possible emotional reactions to change, along with the more pleasant ones. But they may not be the best way to respond to change—a response being what we actually do with those emotions and the situation. Yoga is essentially a practice of noticing what's going on for us. It's supposed to provide a safe space for us to notice our stuff (sadly, we all have it) and just give it some space to breathe. It's also about learning skills to deal with that stuff (because letting it all just hang around isn't really all that helpful, is it?) so we can respond to any given situation more *ahem* helpfully. I've talked before about the fascinating research which found that different types of physical exercise stimulate different parts of the brain. Anaerobic exercise, which is stretching or strength training (yoga, anyone?) appears to increase activity in the part of the brain that helps us to resolve conflict and to distinguish between confusing sources of stimulation. That conflict could be internal stuff, or it might be because someone has just cancelled a meeting on you for the third time in a row. Moving the physical body is a pretty amazing mood regulator and will often help with whatever level of weird is going on in the mind. If, like me, what you notice is that you're feeling overwhelmed, maybe you need to stay in child's pose for the entire practice, lie in constructive rest, or do some slow stretching. If you notice that you're more restless you might need to be more active (sun salutes and standing poses, perhaps) to use up some of that excess energy. But how do you know unless you take a moment or two to notice? Perhaps the biggest thing for me about learning to observe my mental and emotional states, as well as my physical body, is that I've gradually got better at seeing when I might need to go a little easy on myself (hint: more often than I actually do). Sit or lie somewhere comfortable. Maybe even come into child's pose. Perhaps put on a piece of tinkly relaxy music that lasts for five or ten minutes. Start by noticing the sounds you can hear around you. Then notice where your body touches the floor and how that feels. Go back to noticing the sounds around you. Then come back to your body, notice your breath. Go back to the sounds. Come back again to the body, see if you can notice your heart beat. If you can feel or hear it, just observe it for a while. If you can't, that's okay, instead see if you can notice how your chest moves with your breath. Now, do you notice any emotions or thoughts that come up, in just the same way as you've been watching your physical body—as if you're an outside observer? See if you can just let those things come and go for a while. Let your mind wander. If anything is a bit too much and you feel overwhelmed, that's okay, just come back to noticing your heart beat or your breath. When your music finishes, bring your focus back to your breath for a few minutes. Wriggle your toes and fingers, take a few deeper than normal breaths. When you do get up, get up slowly. 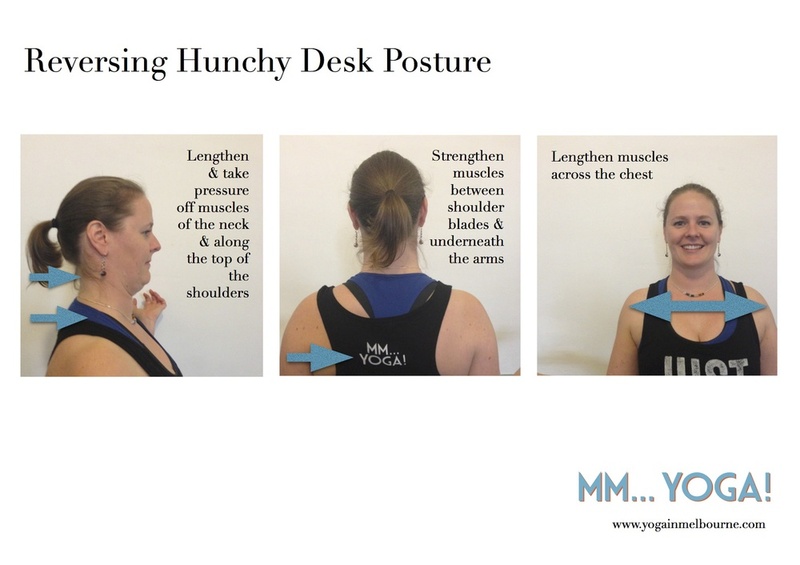 You can do this sitting at your desk too, just sitting, without anybody noticing. And the more often you do it, the better you get at it. Practise makes... well, not perfect, but better. Legs up the wall is another great pose to do this witnessing exercise. Take a load off! When we did our survey, a fair number of you wanted to know how to get people excited about yoga at work. It's true: running successful and well-attended yoga classes at work can be a challenge, even if you and your colleagues really do love yoga. So we thought we'd ask the organisers of a couple of the longest-running and most successful MmYoga classes for their expert tips! 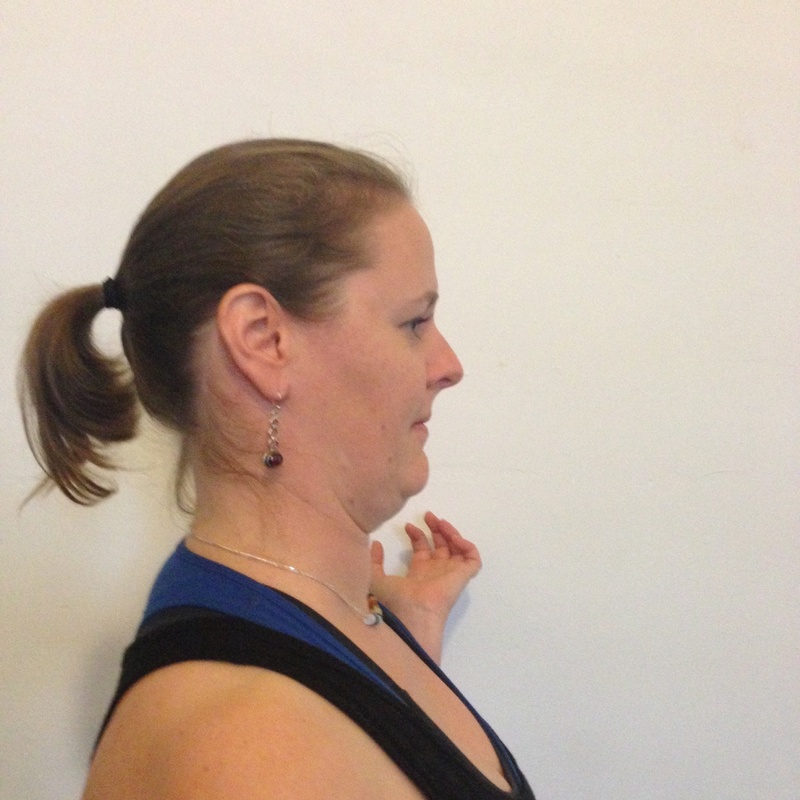 Alyson has had MmYoga classes running consistently in her workplace for about five years; Rosanne for about four. How do you go about organising for people to get involved? Both Alyson and Rosanne use email to gauge interest and inform people about classes, and Rosanne also uses word of mouth. “About three weeks prior to the end of term, I send out an email to the group asking for their intentions for next term,” says Alyson. “So I need to know if they want to continue, and if so, how many sessions are they wanting to attend,” she says. Flexibility with the number of sessions helps, Alyson says. At her workplace, the terms are 20 classes long, but participants are able to attend 5, 10, 15 or all 20 of those sessions, which allows them to work around annual leave. “I keep a list of email addresses of anyone who has EVER expressed an interest in anything remotely related to yoga,” says Rosanne. “We also have a social yammer network at work and this has been used occasionally with mixed results,” she says. Both Alyson and Rosanne say it helps to occasionally open the invitations to classes out beyond the current list of attendees. “If it looks like I'm not going to get the numbers, I send out a global email to all people in the building, with a bit of a spiel about the yoga,” Alyson says. “I always get a lot of interest from this,” she says. Rosanne says she has found it useful to have an ‘open’ class towards the end of a term and invite people who haven’t already enrolled in a term to come along and try. How do you keep them involved? Alyson says people are more likely to stay involved if they feel like the space is a safe one and that people from all levels within the organisation can feel comfortable in. “We also have a bit of fun, and joke around a bit so everyone feels comfortable,” Alyson says. Money also comes into it. Alyson says keeping the numbers up means the cost is more manageable for everyone, and this is something she is clear about when she’s organising the classes — which encourages people to recruit their friends and colleagues to come along too. What are some of the challenges of organising a yoga class in a workplace? Alyson says that finding the time to keep things going and keep the lines of communication open can be difficult at times because there is quite a bit of organising and chasing people involved. There are also lull periods where the organiser needs to amp up the advertising to get the numbers. Rosanne says it can be difficult sometimes to find an available space in which to hold the class. While every work place is different, Alyson and Rosanne have some good general tips for getting around some of the logistical challenges of organising yoga at work. “It really is about making everyone aware of it,” Alyson says. “So talk about it, publicise it, get it talked about in the workplace,” she says. Getting the support of the Workhealth team or Occupational Health and Safety representative is useful too. Being knowledgeable about the bureaucratic ins-and-outs of the organisation really helps, Rosanne says. “And, trite but true — professionalism and being courteous always helps,” Rosanne says. The challenges of organising yoga at work are worth it though. 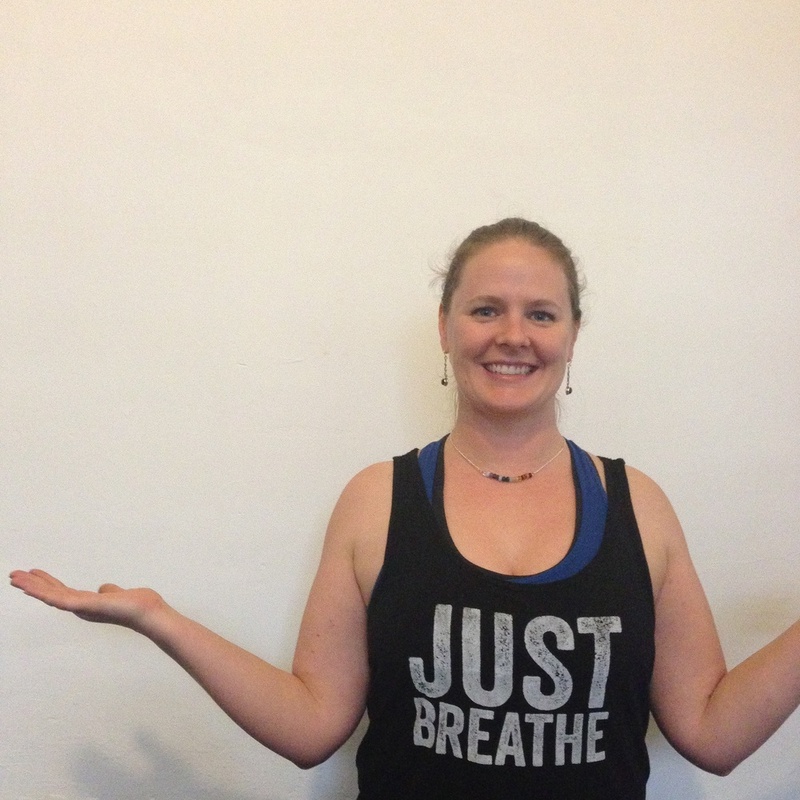 Rosanne says she’s had good recognition from her workplace for organising the yoga classes. “I used to worry about the potential for injury (even minor) of a work colleague during a yoga class that I’ve organised,” Rosanne says. “I feel responsible for their safety (particularly for new participants). On the other hand, I also get a nice warm-fluffy feeling thinking that I’ve contributed in a small way to peoples’ health,” she says. Alyson has noticed a huge improvement in workplace culture: people from different teams talk to each other, and people from all levels come along - from junior to senior. Warm and fluffy, plus a better work environment. Yay! When I first trained to teach yoga, I wanted to be a yoga teacher so badly it made me feel physically ill. Which sounds like a bad thing but kinda wasn't. You see, until that point, I'd never felt particularly passionate about anything. But when I qualified, I found out things I hadn't expected.